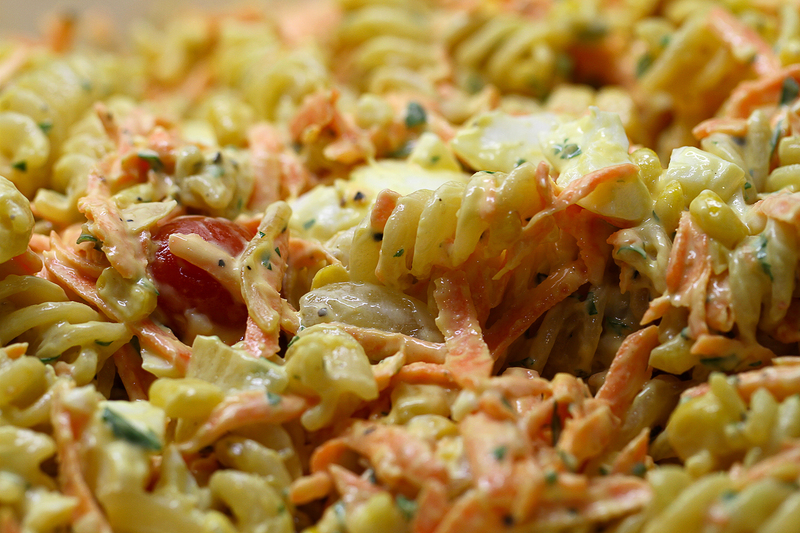 This is a great little pasta salad that’s great to take for lunch to work or to have with a nice salary lunch with cold meats, bread a nice mixed salad. 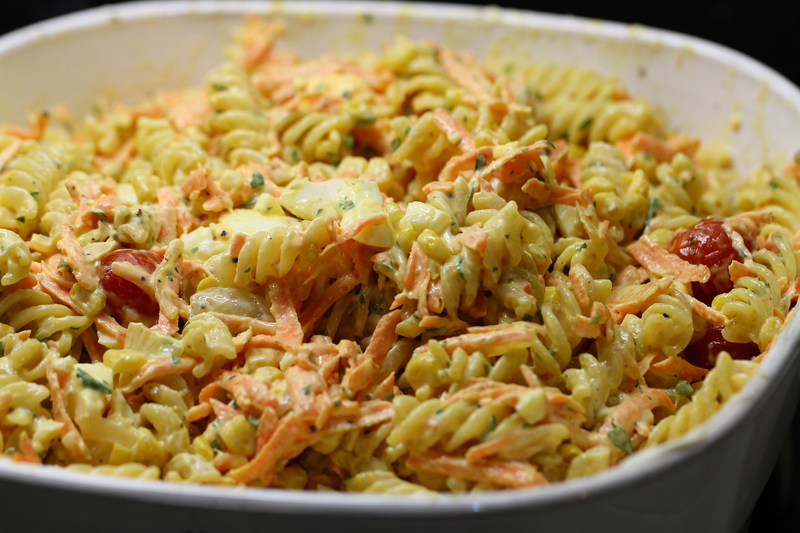 300g Pasta – I used fusilli but anything is fine really, don’t use Penne, it’s boring. 4 sweetcorn – I like to use fresh corn on the cob and cut the corn off. Much nicer. 1. ok so very easy. Bring some water to the boil, add a couple of large pinches of salt and add the pasta and stir. In another pan add the 4 eggs and cold water then bring to the boil. They will be done in the same time as the pasta. 2. While the pasta is cooking slice the onions and add them to a pan with some extra virgin olive oil. Cook these off for a few mins then add the tomatoes whole. Season with salt and pepper. 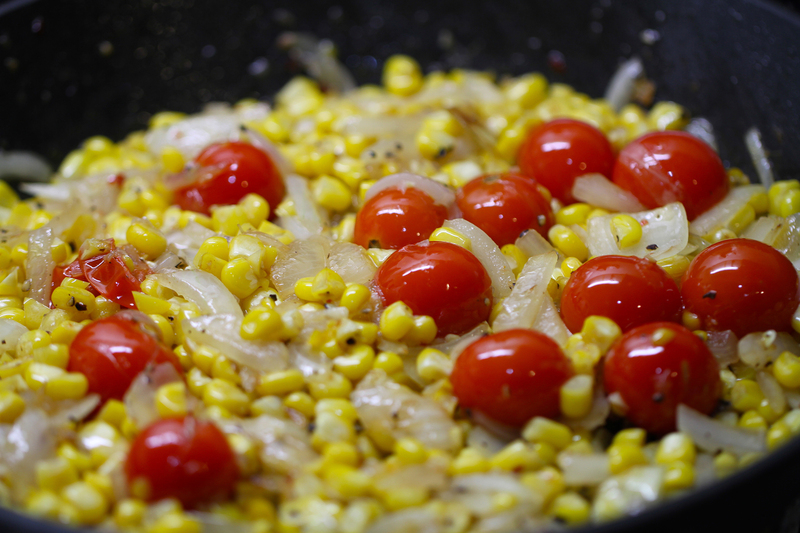 Put a lid on the pan and give this 2 mins then add the sweetcorn. Season with a touch more salt and pepper and pop the lid back on and turn down to a low-medium heat. 3. In a bowl add about 4 tablespoons of mayonnaise, add salt, pepper, the juice from one lemon and the fresh parsley and mix well. 4. The pasta should be cooked in a bout 9-11 mins depending on the type of pasta. Drain then put in a large bowl and add a splash of olive oil and a knob of butter. Now add the mayonnaise mixture and mix well. Now add the carrots and the sweetcorn, onion, tomato mixture and stir well. Get the hard-boiled eggs and chop up into the mixture. Grab the feta cheese and chop up into little cubes and mix into the mixture. That’s pretty much it. Taste and season if necessary. Serve with a nice mixed salad, some tasty cold meats and some awesome sourdough. Hello I would like to know do this pasta suppose to be serve cold or hot?